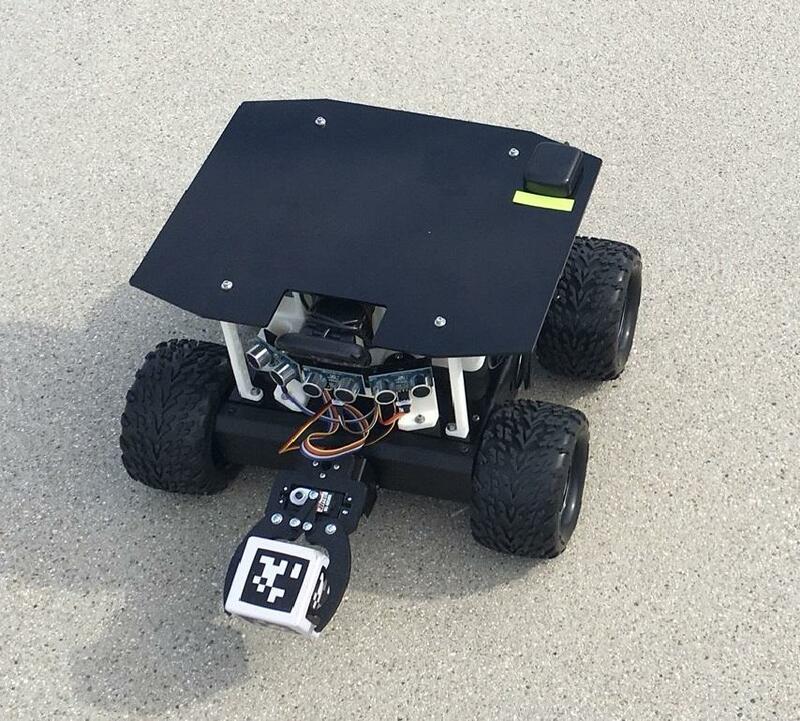 This small robot that CSUCI students built is collecting blocks. Jason Isaacs, assistant professor of computer science, and his students are testing their algorithm with one robot. This robot is supposed to collect blocks and drop them off on the white square, which represents home base. Kelsey Geiger, a CSUCI computer science student, is testing her algorithm using a simulator. KCLU's Debra Greene reports on a group of South Coast college students who are creating computer code that could be used by NASA to send robots on space exploration missions to Mars. Someday in the future, NASA hopes to send a swarm of autonomous rovers to explore Mars. But, before they can do so, they need to create a computer code so that these robots can run on their own and work together. Some computer science students on the South Coast are among those across the nation who are working on code that could revolutionize space exploration. A small, one-foot-tall robot that has four wheels moves across the ground at Cal State Channel Islands in Camarillo as it attempts to pick up blocks with its grippers and drop them on a home base. He’s working with 23 other CSUCI students to develop an algorithm – or computer code – that will allow three robots that they’ve built to collect the most blocks, which represent ice or other resources that could potentially be discovered on the Martian surface. “Our students have to write code which observes what the sensors are detecting and then write computer programs to tell the robot where to go next and what to do next. So, it’s completely autonomous, much like a self-driving car,” said Jason Isaacs, assistant professor of computer science. He says his team is one of 40 college teams across the country competing in what NASA is calling a Swarmathon that aims to improve space exploration with swarm robotics. “Say you have a hundred. You can’t have a hundred control rooms full of engineers driving each one. So, they have to be smart enough to drive themselves so to speak. So, they have to be able to interact with each other, not run into each other, be able to signal to each other,” said Isaacs. These small robots can work faster and more efficiently than a conventional rover. NASA says its Mars Exploration Rover named Opportunity spent 11 years searching 26 linear miles on Mars. But, it would only take eight hours for 20 of these small robots to accomplish the same task. So, NASA has turned to colleges to further advance technology for future space missions and to improve students’ skills in computer science and robotics. In a computer science lab, students are working vigorously on their algorithms. Kelsey Geiger, a junior, uses a simulator to watch her code play out on a computer monitor, which looks much like a video game. Outside, students test and refine their algorithm with one robot collecting blocks. Sometimes it works. But, other times it doesn’t, as Nicole Dubin, a junior, encounters. “It’s definitely challenging. It requires a lot of time to spend understanding what it’s trying to do so that way you can know how to tell it what to do,” she said. But, Jeremiah Paltridge says the experience is worth all the effort. “It’s a very satisfying field to be in where you can create something. Spend hours behind a computer screen. Type way into the night. Then, you come out the next day, you plug your code in and you see a robot running around, picking up cubes, doing what you told it to do."